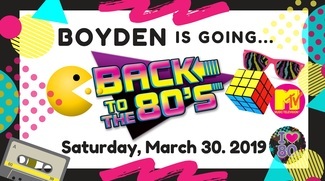 Come out for a fun night out enjoying 80's tunes spun by Good Times Unlimited. This PAC fundraiser is a night to raise money for a better field and basketball hoop area. There will be raffle and silent auctions to bid on, these funds will go back to the school for the playground, so bring those wallets! Please dress up in 80's attire (optional) ( favorite tv, movie or music icon or even come together as a group coustume)prizes for best woman 80's costume, best man 80's costume and best group costume) There will be appetizers served and a cash bar ( signature drink too, proceeds from those drinks will go back to school as well. This will be such a fun night out raising money for our school. Hope to see alot of you there! Can’t wait to sweep the leg! Mike and I will be there, can’t wait!